Remembrance Sunday, 12th November, is coming up in the UK: the Sunday nearest to the 11th of November, the date the First World War ended, when by longstanding permission priests in England and Wales are allowed to celebrate a Requiem Mass for our war dead. There will be truly worthy sung celebrations of the ancient Mass for the Dead in the Birmingham Oratory, and in St William of York, Reading, with the Fraternity of St Peter. Those locations are about 100 miles apart, or a two hour drive. Between them, the only place where you will find a Sung, Vetus Ordo Requiem Mass on Sunday will be in Holy Trinity, Hethe, at 12 noon (click for a map). This is the oldest Catholic parish church in Oxfordshire, noted for the beauty of its decorations. 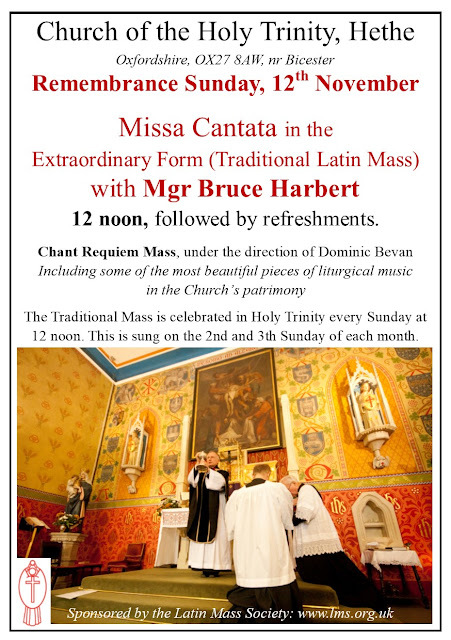 Mass will be celebrated by Mgr Bruce Harbert, the well-known liturgical scholar, and the singing will be led by Dominic Bevan. Please join us to pray for the war dead, some of whom are buried in the graveyard next to this church. I'm pretty sure the FSSP are having a Sung Mass in Chesham Bois for Remembrance Sunday as well, at 8am. I'm in the scola so I'm fairly certain that's right, but I suppose it may be subject to change. There will also be Sung Masses in St Bede's Clapham Park, SS Peter & Paul in the Wirral, St Walburge's in Preston and St Mary's Warrington - and no doubt other places. I wasn't attempting to be exhaustive. Victoria's polyphonic Requiem, at 11am, St Mary's Shrine, Warrington - Remembrance Sunday, 12 Nov. Celebrant: Fr Konrad Loewenstein, FSSP.